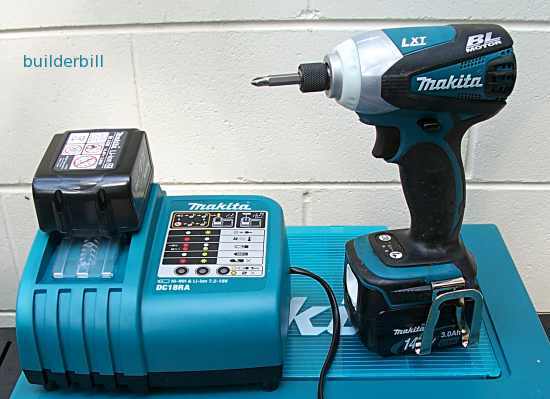 A cordless electric screwdriver that uses vibration or impacts on the screw head to drive or remove screws. Above is my brand new cordless Makita impact driver. my old faithful carked on me after going under water for a period. I could have got it fixed I suppose but as I won't use it often then the new LI-Ion batteries were very attractive. Although I am now officially retired I felt that I had to replace it as these tools are just so useful. These drivers have a vibrating mechanism built into them that drives screws far larger and into harder timber than non impact versions. They are incredibly good at removing old and damaged screws. 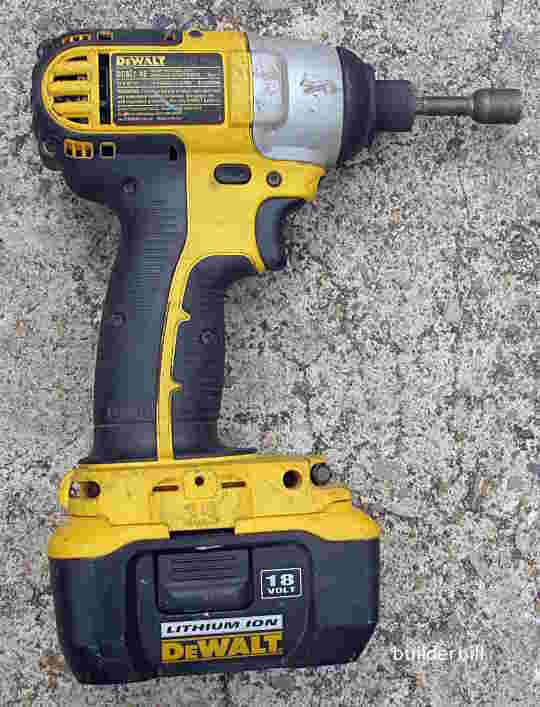 Similar to their larger relations the air operated impact wrenches they do have a tendency to sometimes go too hard and break screws, but once a feel is got for the machine I feel that very few people would change back to an ordinary driver after using one of these. This particular one runs off 14.4 volt batteries and comes with a battery charger and spare battery. Like many of these power tools these days it has a small light that shines on the work area when the trigger is slightly depressed. It turns itself off after a few seconds of not being used. Like a lot of these features, this one grows on me and after using it lying on my back reaching up inside a kitchen cabinet one time I found it to be great. Sure I could have dug a torch out of my kit but this was so direct. I have also used a mate's jigsaw with a light and that left me with a touch of "tool envy". An 18 volt Li-Ion DeWalt unit that belongs to a plumber mate of mine. He has quite a few of these DeWalt tools that he bought as a special promotional deal and it has certainly worked for him as he swears by them.